NC State propels research forward through interdisciplinary impact. A focal point in the university’s strategic plan, interdisciplinarity brings scholars with diverse skills and perspectives together to create a culture of collaboration on campus. Through classes, buildings, research and educational initiatives and more, interdisciplinarity is more than just a higher-education buzzword. It exists as a way of thinking across the university that leads to action. Spaces across campus help support interdisciplinarity by making crossing disciplines more tangible. The Biomedical Partnership Center on the Centennial Biomedical Campus provides laboratory and office space for faculty in sciences, engineering and veterinary medicine. By design, the center underscores the true importance of faculty being together in a physical space: advancing research. Other interdisciplinary spaces, like the Center for Geospatial Analytics and Bioinformatics Research Center, support similarly impactful research by providing a home for faculty outside individual colleges and departments. The university also facilitates the open exchange of ideas through the Faculty Commons in Hunt and D.H. Hill Libraries, along with spaces that revolve around unique tools, like the Molecular Education, Technology and Research Innovation Center, which gives researchers access to measurement science facilities throughout four campus buildings. Interdisciplinarity, regardless of if it exists in a physical space, touches nearly everyone in the NC State community, including students. Academic requirements like the General Education Program encourage students to take courses outside their chosen major. Undergraduate students must satisfy a 5-hour GEP requirement in Interdisciplinary Perspectives, and may choose from courses ranging from Diversity and Environmental Justice to Practical Arts Entrepreneurship, World Forestry and more. Individual colleges and units create their own programs to cross educational boundaries. The Biotechnology Program is a strong interdisciplinary minor that offers a certificate program, and the Division of Academic and Student Affairs offers a certificate in interdisciplinary entrepreneurship. This focus on undergraduate studies helps create well-rounded students ready to tackle multifaceted issues facing society today. Of course, a real richness exists in the myriad opportunities for students to dive into game-changing research with interdisciplinary faculty. Several National Science Foundation grants to the Genetic Engineering and Society cluster will fund interdisciplinary training for doctoral students in genetic pest management, and support graduate research on the impact of agrobiotechnology on food, energy and water systems. 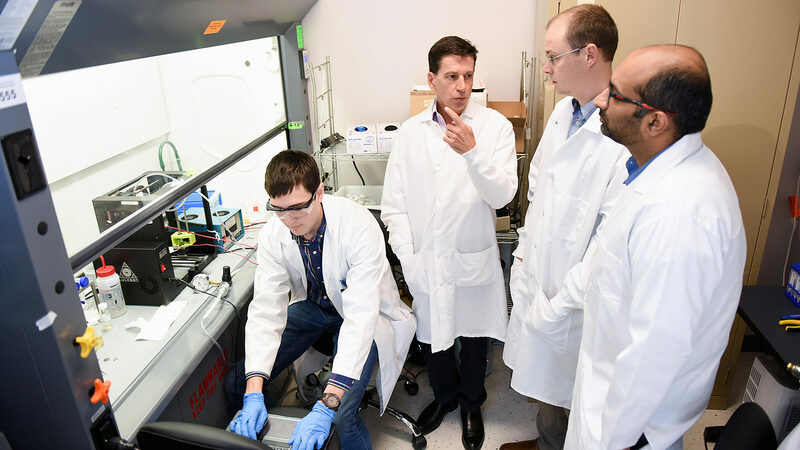 The Comparative Medicine Institute — connected to the Translational Regenerative Medicine cluster — helps train undergraduate and graduate students in team science, a concept that combines scientific research with communication and conflict resolution skills. One of the most prevalent outcomes of interdisciplinary input has been funding received by faculty clusters and other groups. Recent examples include a National Institute of Environmental Health Sciences training grant to the Center for Human Health and the Environment (supported by the Environmental Health Science cluster), as well as grants from the Department of Education, National Institutes of Health and National Science Foundation to fund interdisciplinary graduate research and education. Interdisciplinarity extends further, though, across the entire university. Each year, the Common Reading Program makes an interdisciplinary connection through the Common Reading Mini-Grant Program. Interested participants may submit ideas that bring together different subjects to critically examine the selected book and create a unique interactive and educational experience for first-year students. Faculty and staff may also participate in the Office for Institutional Equity and Diversity’s Diversity Mini-Grant Program and the Office of Global Engagement’s internationalization seed grants. Both programs promote collaborative scholarship and service on campus and around the world. Outreach and Engagement Incentive Grants bring together interdisciplinary faculty, staff, students and community members to encourage research and programming in Kinston/Lenoir County, Rutherford/Polk Counties and Raleigh/Wake County. Additionally, the Office of Research and Innovation supports several interdisciplinary research initiatives. This includes the Data Sciences Initiative, Neurosciences at NC State and the Smart Cities initiative. The Chancellor’s Faculty Excellence Program (CFEP) brings world-class faculty across the academic spectrum to NC State. Established in 2011, the program enhances the breadth and depth of the university’s solution-driven research and innovation. One example is recent applied research from the Sustainable Energy Systems and Policy cluster. In 2017, the North Carolina General Assembly passed HB589, pertaining to energy systems policy, part of which mandated a study on energy storage. Cluster faculty members worked together to conduct this study, completed in December 2018. A new cluster — High-dimensional Integration of Biological Systems (HIBS) — will augment and enhance the current faculty clusters established as part of CFEP. The cluster is envisioned as the first “Connective Cluster,” designed to focus on high-dimensional data science and integrative approaches that connect existing clusters. NC State strives to foster a culture of academic excellence through engaging students, faculty and staff in interdisciplinary research and education. That culture not only moves the university forward, but creates a home for problem solvers to Think and Do with a local and global impact.